There’s nothing worse than having a mechanically sound piece of equipment shut down due to a clogged fuel filter or some other fuel-related cause. One of the main causes of equipment operational malfunction resides in the fuel system.Having access to a reliable source of fuel quality maintenance and analysis is an operational advantage that can save your business valuable resources. Gregory Poole is a local power systems provider offering a full range of products and solutions. We’re the authorized Cat® dealer for eastern North Carolina. With nearly 65 years of experience partnering with a wide range of local industries, Gregory Poole delivers full-service capabilities backed by customer service and product knowledge you can depend on. We’re a one-stop shop for everything from fuel sampling and quality audits to annual diesel fuel certification and fuel tank monitoring. We offer regularly scheduled maintenance as well as emergency service and repairs to help reduce downtime and costly equipment damage. All of our service technicians are trained to use the latest tools and technology to keep your fuel storage systems in prime condition. An unexpected equipment failure can have a devastating effect on your ability to be productive. 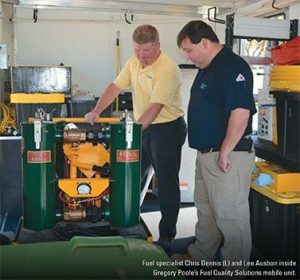 Gregory Poole provides peace of mind by delivering fuel quality solutions designed to protect your system, improve efficiency and lower your costs of owning and operating equipment.